Opening up a picture book, before you even get to the title page, you catch a glimpse of artwork that gives you a tantalising snapshot, detail or mood of the story you're about to read. Silently (and often not so silently) I make a little 'Wooo' noise. 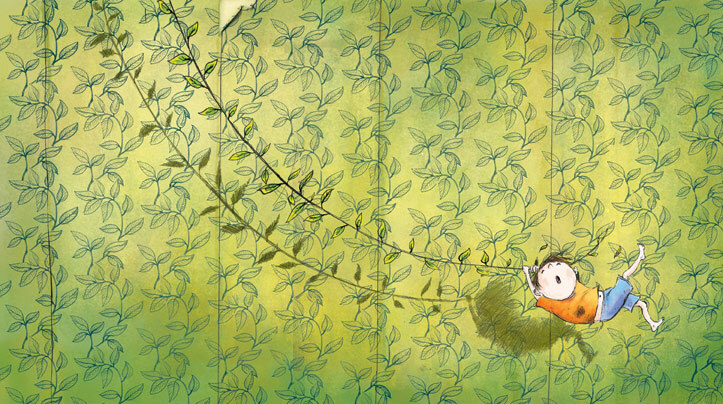 Don't you love endpapers? I just adore them. 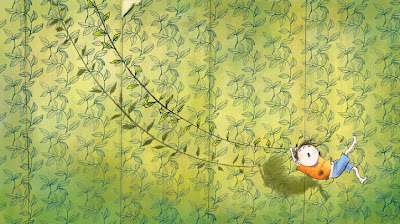 As an illustrator, endpapers can just be a dream. If there's time in the deadline the trusting designer and editor can often give you free rein to run slightly amok. Not to disrespect any talented authors, but there's no text to work around for just these two moments. 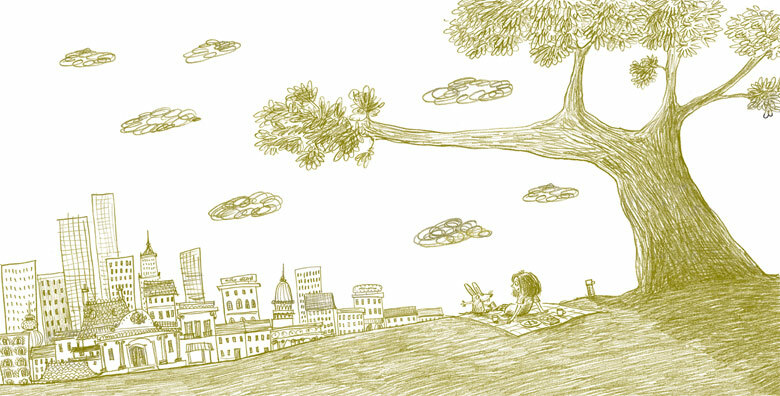 The illustration equivalent of an indulgent rock guitar solo perhaps? I've indulged myself today with including some endpapers of my own that I've really enjoyed doing, followed by (badly) scanned copies of some beautiful examples by other artists that are my particular favourites. FIRST! Sneaky peek - I'm including the endpapers from my new book 'Mabel and Me - Best of Friends' with Mark Sperring and Harper Collins (out end of March 2013). I had so much fun with these. I hope you enjoy. 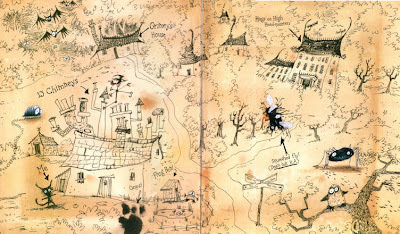 Endpapers for 'The Rumblewick Letters - My Unwilling Witch' by myself and Hiawyn Oram, Orchard books 2006. Great fun to work on these. My lovely designer literally let me go a bit mad with a half hearted idea about a 'map' on the understanding that I would just redo it if it turned out to be awful! I worked on a stretched piece of tea-stained paper, planned virtually nothing and just used black ink. The only thing I half planned was trying to fit 13 chimneys on the house (as in the name of the address in the text). The adrenaline really flowed. It literally was like taking a line for a walk. Front endpapers from 'My Adventure Island' by Timothy Knapman and myself, Scholastic 2012. 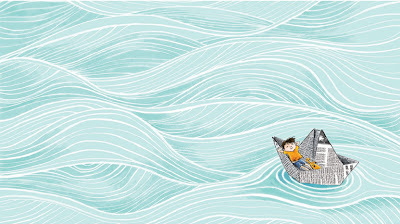 The book was about a boy imaging himself on his own island. I loved the challenge of bringing in subtle hints of 'home' that appear throughout the book. Back endpapers 'My Adventure Island'. 'Olivia' by Ian Falconer, Simon and Schuster 2000. I just LOVE the Olivia books. The minimal use of red as the only colour against the beautifully simple black and white line drawings of Olivia and her surroundings are just a treat to the eyes. 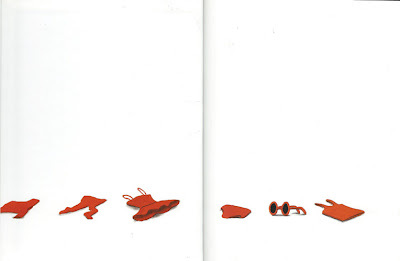 These endpapers sum up the feel of the book perfectly. 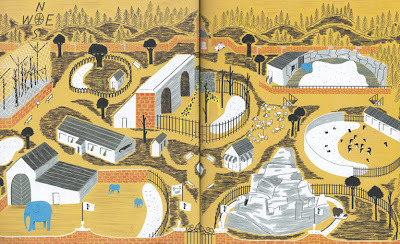 'Mr Peek and the misunderstanding at the Zoo' by Kevin Waldron, Templar 2008. There's so much I like about this book. 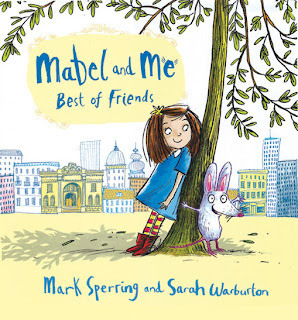 Each page is superbly illustrated, the animals hugely full of character. The colours are are muted with a 'vintage' feel without being dull. These endpapers just sum it all up. It makes me feel like the story is timeless...just makes you want to dive in. 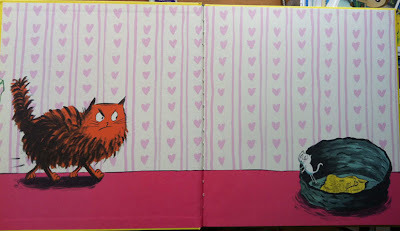 'Mr Pusskins and little whiskers' by Sam lloyd, Orchard books 2007. This is a great book which my children loved (please note the green felt tip just off the edge!). This is a lovely example of an endpaper setting up a story just making you want to carry on to read what on earth is going on. Great energy in the illustrations. Just look at that little kitten...he couldn't possible be horrible in any way, could he? So there you are. You've got to love a good endpaper. Please don't flip past them, as they are often a perfectly visual 'Once upon a time....' and a little 'Full stop' to the whole reading experience. Oh, I so agree, Sarah. 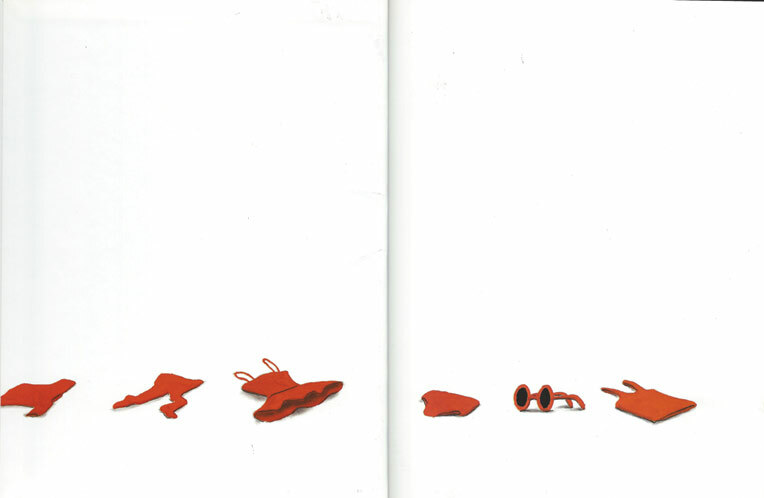 Endpapers... the beginning and end of all. And you have done some beauties. Love the Mabel look. I've never had any endpapers to do, but I see what you mean. I agree with Haiwyn, you've done some great ones. Amazing that you just did the witchy one as you went. First thought when I saw your new ones is that they are both apt for the Illustration Friday theme of the week - Sky. 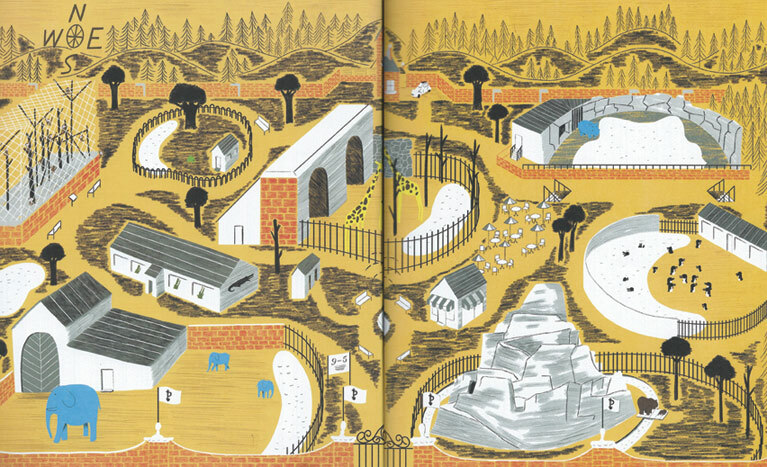 I'll have to check out the Mr Peek zoo book, which does look great. Gorgeously gorge! 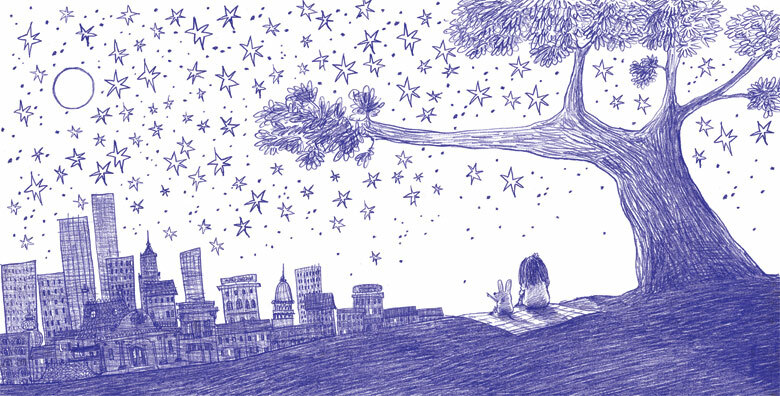 I could spend all day looking through endpapers (including those you did for my books.) These are lovely! Glad to find your blog by the way!